I’ve always enjoyed running on soft surfaces more than pavement. I sometimes run on trails and cinder tracks, but I really get a thrill out of running barefoot on the beach. I spend most of the year now in San Carlos, Mexico, living right on the Sea of Cortez. So my track and my swimming pool await just outside the door! There’s something unique about feeling my skin connecting with the earth with each running step. I savor the sensory experience of the grainy sand compressing under the sole of each foot and the occasional wet wave that washes over my foot. 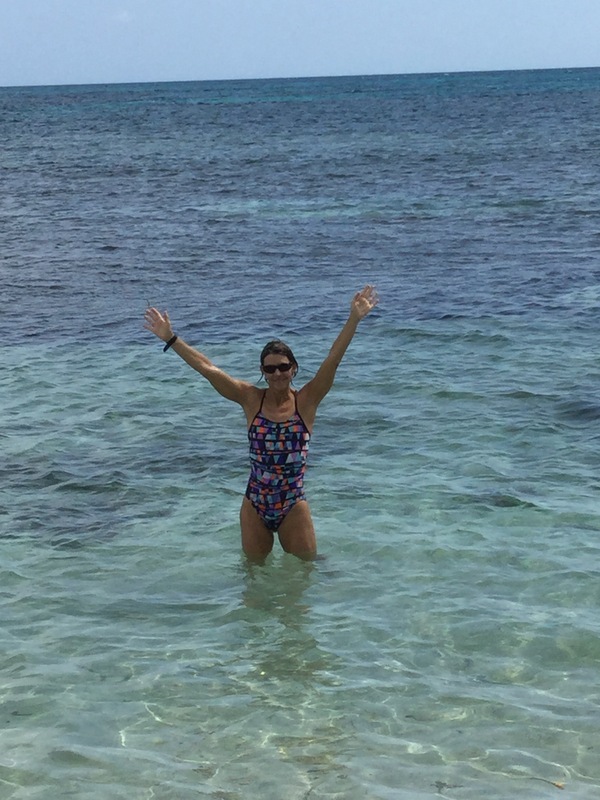 The salt air tinges my nostrils and the sea breeze blows my hair, whistling in my ears as if I strode at a mighty Olympic pace rather than the average pace I actually run. Running barefoot on the beach – or anywhere for that matter – isn’t without risk. My husband blackened his big toe one morning stumbling over a rock. My son had the unfortunate experience of landing on a dead porcupine fish that lay hidden under the sand. And I landed once on a cholla cactus segment that had somehow blown down onto the beach. Ouch! My recommendation for anyone wanting to run barefoot is that you learn first how to walk safely without shoes. Because the barefoot technique is different. Muscles in your feet and lower legs work much harder when you’re not wearing shoes. I started by walking a couple of kilometers on the beach every day barefoot. At first, my plantar fascia and toes felt sore afterward. Sometimes my calf muscles cramped up. Once my feet and lower extremity muscles adjusted, I worked my way up to five to seven kilometers. Then I added running to the mix. Now running and walking on the beach is easy for me. 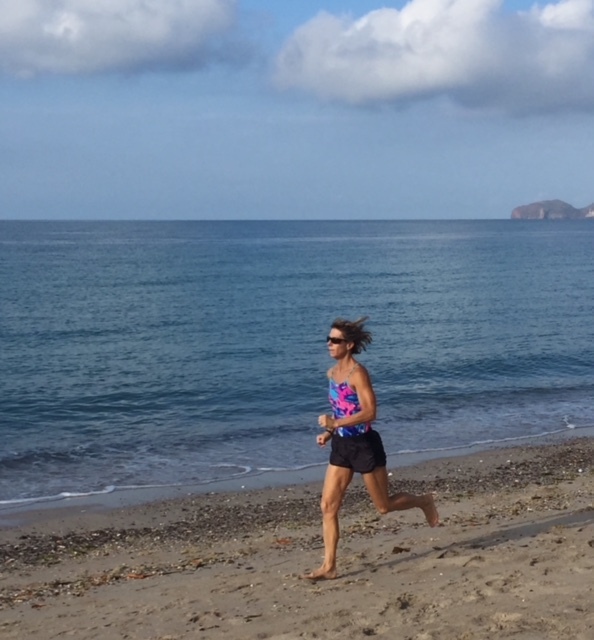 When I first started running in sand, I had to listen to my body, to notice and sense what felt right. I land on the ball of my foot when running barefoot instead of heel-striking the way I do in shoes. That seems to absorb the impact from my landing best and gives me the opportunity to do a sudden weight shift if I feel something sharp under my foot and don’t want to put full weight on it. Other runners may find a different technique works best. Connecting your naked feet to the Earth not only is a wonderful sensory experience, it offers abundant health benefits as well. Your heart, muscles and nervous system all receive electrical impulses from your body’s cells. The earth’s electrical energy helps keep human bodies and the bodies of all living beings in balance. When we spend too much time indoors, we don’t receive nature’s healing benefits. When your body has a chance to connect with the Earth’s electrical energy, you sleep better, inflammation is reduced, you perceive pain as less traumatic, and even heal faster from injury and illness. This isn’t just hocus pocus. More and more studies are coming out that show connecting with the Earth is not only beneficial, it’s necessary for optimal health. Please read this informative article by Chevalier et al. in the Journal of Environmental Public Health for a more in-depth understanding of the benefit of grounding or earthing. If you haven’t tried barefoot running, but have the urge to try, why not give it a go the next time you head to a grassy park or a sandy beach. For me, there’s something joyous and childlike about running in the sand. If you’re like me, you might have so much fun running barefoot, you find yourself skipping along or turning cartwheels in the sand like you were 10 years old. Learn to be a better runner, avoid injuries and train smart with Dr. Jason Karp’s REVO2LUTION RUNNING program. I have taken several workshops from Dr. Karp over the years and he’s an amazing educator! For information on certification courses for runners, coaches, and fitness professionals, check out the REVO2LUTION RUNNING web site. Use code SUSANCOOK for a 15 percent discount on any course. Yesterday, I competed in an open water swimming race in Guaymas, Mexico in the Sea of Cortez. 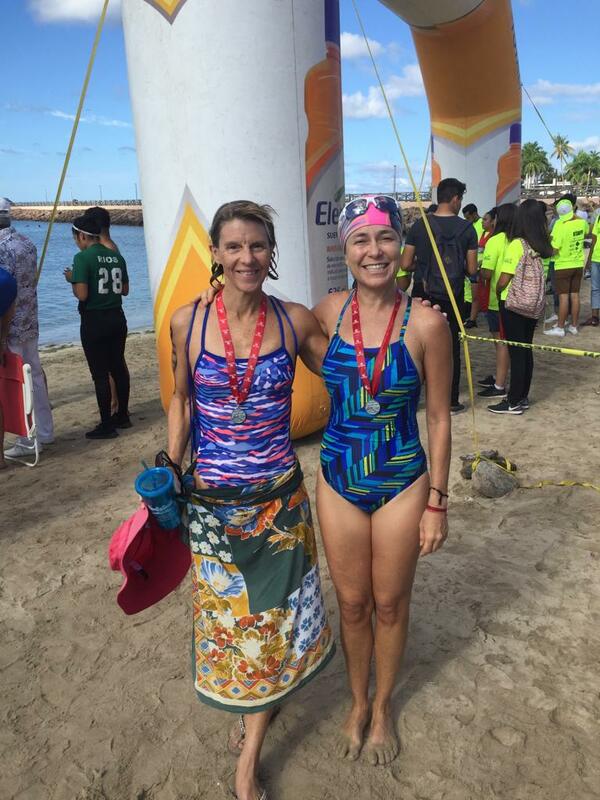 It was the Cruce de Bahia Miramar event and more than 200 swimmers participated. I swam the 1800 meter race, which began at the beautiful old Cortez Hotel and ended at the Miramar beach. The race started at 7 AM. My husband was slated to help with kayak support, so he needed to drop me off early at the start. At 6 AM, I stood on the dock on the water at the hotel. The sun hadn’t yet risen and the sky was purplish pink, the sea smooth as glass. Water lapped over rocks the nearby beach, where dozens of pelicans soon took off, gliding over the water in search of fish. The competitors gradually arrived. Some plunged in the water right away, wading in from the beach or somersaulting off the end of the dock. People greeted each other with a cheerful “Buenas Dias”–and often hugs and kisses. I spoke to some of them in Spanish. Competitors weren’t from San Carlos or Guaymas–some had driven an hour or more from Hermosillo or Obregon or Kino Bay. Swimmers began performing various warm-up activities under the palm trees on the beach–stretching, arm swinging, jumps. Even with hundreds of people gathered–the event lacked the noise and chaos of a pool swimming event. People spoke quietly. There was no loud whistling, screaming or horns. I still felt connected with nature. I heard birds singing and could watch them dive for fish. All around were pelicans, cormorants and terns. I watched the brilliant orange sun slowly make an appearance over the arid volcanic peaks in time to cast an orange glow across the water. I waded into the shallow water to warm up, watching fish–parrotfish, sergeant majors and puffers–swim below me. People were lining up along the dock now. The race was about to start. And then it began. There was a flurry of arms and legs splashing at the beginning. I jerked to a stop when someone not used to swimming straight in open water came at me on a direct collision course. Gradually, the crowds disappeared. I was back to swimming alone in the water just like my regular mornings training at San Francisco beach. I could still see fish below me, stretches of rocks and rippled sand. I felt the water flow past me as I swam. I tasted salt. Smelled it. Experienced it. All my senses were thriving on this experience of propelling myself through this marine world. The water rushing past me made me aware of every muscle. I sensed the instant my hand first connected with the water each time before it began to pull through the heavy water. I felt it flow over my shoulders and back. I felt my calf muscles contracting with every kick. With every stroke, the thick, salty water was massaging my body, energizing me, making me feel so vibrant, so alive. I live for this experience! It’s like nothing else I ever experience. Only the water can make me feel this good. I sited on the buoys to stay on course. There were seven of them–some bright orange, the others neon yellow. I swam next to a young girl for a while, matching her stroke for stroke. Then she pulled ahead of me. I drafted off of her for a hundred yards or so until she pulled further ahead of me. I was back to being alone in the water. I could see the colorful inflated balloon arch of the finish. I couldn’t believe the race was almost over already. It felt so good to be swimming, I felt as if I could just keep on going. For another 30 minutes, an hour, maybe the rest of the day. The sand was just a couple of feet below me now. People were walking through the water toward the finish, too tired to run. Others made the effort to run. I swam a few more strokes. Swimming is always easier for me than moving on land. Finally, I stood up. Ran for the finish. The water slowed my legs. They felt heavy as I dragged them through the shallow water. But I was almost there. I smiled and waved to all the spectators as I ran through the arch. Exhilaration rushed through me. This was so much fun! In Mexico, athletic events aren’t just attended by spouses and kids. There were grandmothers on the sidelines. Aunts and uncles. Neices and nephews. I was expecting some friends to come and meet me later, but I didn’t see them when I finished. I strolled down the beach a ways, noticing how good the water felt on my skin in the morning breeze, how soothing the sand felt squeezing between my toes. I knew then, as I’ve known for some time that open water swimming is the perfect realm for me. I’ve always loved the water. But swimming through water where I can experience the full range of sensory experiences that the natural world delivers is quite simply amazing. Every single time. Me with a wonderful friend, Veronica Garcia, after our races. There’s a lot of information available online today. If you’re experiencing a health condition, such as migraine or fibromyalgia or diabetes, that’s what you’re looking for, right? Information that – along with the guidance of your physician or specialist – can help you understand your condition better and learn ways you might be able to improve your health status through natural or medical means. I can tell you honestly, useful health information is hard to find any more on the Internet. Much of the information you read online is censored. There isn’t as much free speech on the Internet as any of us would like to believe. Authors are hired to write articles to support advertisers on websites and blogs. Some won’t share lifestyle changes that can improve health and that may even be much more effective than expensive drug treatments simply because they don’t bring in profits. Facebook groups disallow free speech – completely, blocking posts from any members who don’t support whatever the administrators are selling. I find this very upsetting. People who just want to get well are being deliberately deceived. I have found the best way to combat this problem is to read books and scientific journal articles written by intelligent, educated authors. I read book reviews, keeping in mind that some of them may not be authentic. I devour the content and try to understand it in detail, so I can use my 30 years of fitness experience and my Masters in science to decide if it makes sense. I don’t trust that someone else will do what’s best for my health. Do you want to put all your faith in a doctor, a medication, or a website? Or do you want to play an active role in improving your health? Don’t assume that the limits of improving your condition are confined to what’s being posted on a blog or in a Facebook group. Read. Research. Talk to real people who suffer from a similar condition and who don’t have any financial agenda behind what they’re recommending. Discuss possible lifestyle changes that have been proven to be beneficial for your health condition with your health provider. Keep reading. Keep researching. Don’t be afraid to make some changes. You can take charge of your health. You are your own best health advocate. I am officially a Regional Sales Director for Revo2lution Running, founded by leading running expert Dr. Jason Karp. If you are a personal trainer, running coach or a runner seasoned or new, this cutting-edge program can give you the competitive edge. You can attend a course to become a certified professional or as a runner. Courses are offered in most U.S. cities and many countries worldwide. There is also a home study course that makes it easy to learn during your free time! Learn the importance of knowing your VO2 Max and Lactate Threshold in doing effective training. Learn how to create a running program for someone new to running, whether it be you or a client. If weight loss is a goal for you or your client(s), learn nutrition tips that will make this goal more achievable. And most importantly, learn how to run safely with less potential for injury. 65 percent of people to participate in running experience an injury over the course of the year, which can mean missing races, fun with friends, and interfere with weight loss goals. Why not avoid injury altogether so you can keep on running? Knowledge is power and Dr. Karp’s program will give you power with a capital P and so much more. 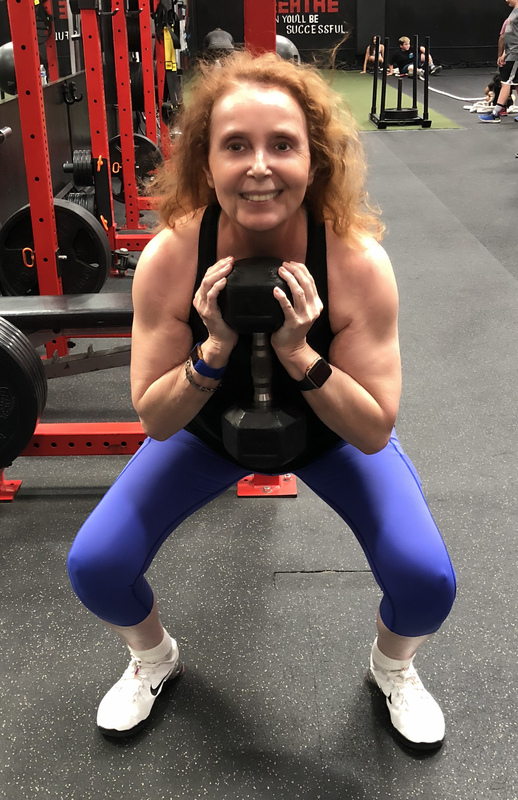 To read about or sign up for a workshop, home study program, runner mentoring programs and more, check out the Revo2lution Running web site. For a 15 percent discount on your workshop fee, please use the code SUSANCOOK when you purchase. I recently published an article with Migraine Again that discusses all the health benefits of living by the sea. I have learned firsthand the benefits of the seaside lifestyle ever since we bought a condo on the Sea of Cortez in San Carlos, Mexico. I swim in the sea every morning, often surrounded by dolphins. The bay where I live is called Bahia Delfin for a reason! 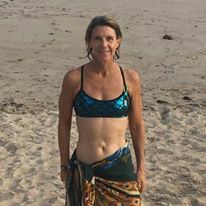 I do yoga and meditation in the sand and take long beach walks every day barefoot. Now I have fewer migraines, better digestion, and more energy and I often feel like I’m 18 instead of 55! Every day I feel grateful for how my yoga practice led me to make this life change that has been so beneficial for my health and well-being. Click this link to read my article on all the benefits you can reap for mood, immune system and more! Does Your iPod Music Stop Playing? Sometimes teaching a class goes off without a hitch. There are other times when issues come off. For me, more often than not, they’re technical. If it’s not troubles programming the heating and cooling unit (I miss the old switches – heat/cool, and the dial that you adjust that points to the temperature you want), it’s an issue with the stereo (or the device I’m playing music from). Sometimes I really miss the days where all I had to do was insert a cassette tape and start class. It was so easy. And I always had dubbed backups. Now I have to set the stereo to the proper mode, choose the playlist and hope that when I hit play, music starts playing. Recently, I had a situation where the music would play for about a minute and then stop. 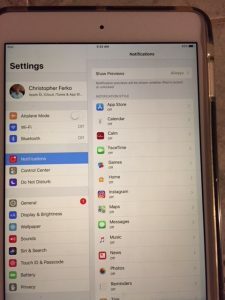 It wasn’t as if I bought this iPad last week. 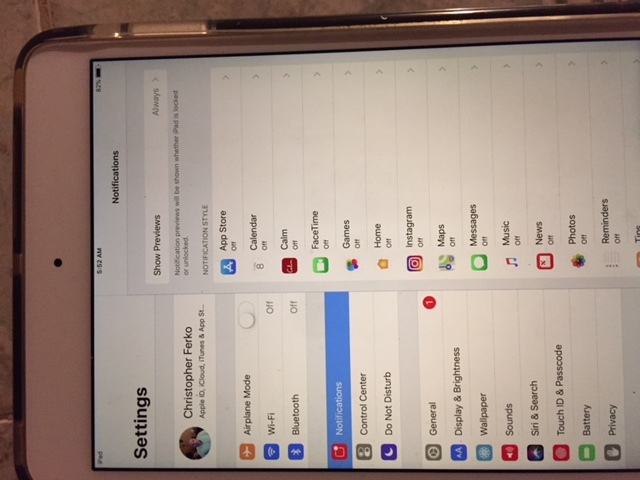 I’ve owned this iPad Mini 4 (2015) for more than a year and have never had this problem before. This drove me nuts. I tried to play a song again. Same thing. At that point, I continued class without music. Afterward, I went online and started looking for suggestions on what to do. I tried closing all open applications, rebooting again, still nothing. Then I found a post that mentioned notifications as the possible culprit. I’m not a fan of those anyway. Whenever headline news flashes up on a notification, there is a temporary break in the music. And this is distracting. I went into settings. And the list of items that had notifications defaulted to on were tremendous. App Store, Calendar, Calm App, FaceTime, Games, Home, Instagram…you get the picture. There were ten more. I turned notifications off on all of them and guess what? My music started playing normally again. I’m not sure which notification was the music-stopping offender. But I’m content for now to leave them off so my music plays uninterrupted AND I have less distraction. Most wheat products on the market today are highly processed and sprayed with the harmful chemical glyphosate. Many people also have sensitivities to wheat or the final product after treatment and processing. Ancient grains, cultivated by different native cultures around the globe, provide nutritious options for meeting your carbohydrate cravings. Black rice, also known as “Forbidden” or “Emperor’s” rice because it was used as a tribute food for royalty in ancient China, is rich in anthocyanins. One study shows consuming it regularly reduced arterial plaque. So try colorful rice next time instead of white. Millet is described in the Bible as a grain grown in the Hanging Gardens of Babylon and was used to make bread. It’s gluten free and has a nutty taste and a fluffy texture. Millet can be cooked up for a breakfast cereal (with some dried figs, ginger and cinnamon perhaps), can be used in baking or frying batter, or added to a recipe for stuffed squash. Once you get a taste for its flavor, you’ll be able to get more creative and use it in other recipes. I’ve crunched my way through a bag of blue corn tortilla chips without even knowing how nutritious they were. Blue corn, rich in anthocyanins like black rice, is lower on the glycemic index (good for people watching blood sugar) and contains more protein, zinc, and iron than white and yellow corns. It’s origins lie in the American Southwest and Central and South America. The Hopi Indians used blue corn in religious rituals and still use it today to cook piki bread. Add some anthocyanin color to your next breakfast by making your pancakes or muffins with blue corn. Quinoa dates back to the Inca Empire in Peru and has just recently been recognized as a superfood. It’s gluten free, protein-rich, and contains all nine essential amino acids. 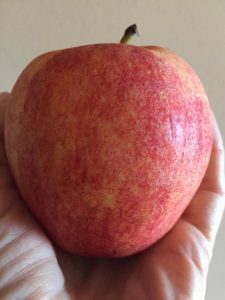 In addition, it’s rich in fiber, B-vitamins, magnesium, iron, potassium, calcium, vitamin E, and phosphorus. Quinoa also contains abundant flavonoids, which fight down inflammation and the proliferation of cancer cells. Quinoa can be added to smoothies, eaten like oatmeal, added to nutrition bars and used in place of other kinds of pasta for cooking. Purple barley, a dietary mainstay in ancient Tibet and the Middle East, is high in protein and has a low glycemic index. It also contains important vitamins and minerals potassium, iron, calcium, selenium, phosphorus, copper and manganese. It’s a great addition to soups, salads, and pilafs. Want some for breakfast? Grind it up and use it as flour for your favorite pancake, muffin or waffle recipe. Amaranth was a favorite of the Aztecs and is gluten-free and is rich in protein and the amino acid, lysine. This grain they called huautli played an important role in religious rituals. Amaranth was eventually outlawed by Spanish conquistadors. But it’s made a comeback in recent years. In Mexico, people mix it with honey to create the Latin version of rice crispy treats. Many recipes using amaranth are available online including ones for amaranth pancakes and amaranth fish sticks. Add some of these new foods to your diet and start reaping the taste and health benefits today. I’m a big believer in eating real food. A typical breakfast for me consists of organic oats – topped with sliced banana, blueberries, chia seeds and walnuts – and drizzled with whole organic milk. Favorite lunches are 1) plain yogurt blended with papaya chunks and 2)a plate of organic corn tortilla chips topped with melted cheese, salsa with avocado, and pinto beans. For dinner, I usually saute different varieties of vegetables with chicken or fish. I almost always cook with olive or coconut oils. While I work hard to eat and find places I can buy an abundance of real foods, the food industry, media and general public continue to sabotage these efforts. Food companies know how to make food that stimulates your taste buds, often to the point that they lose a taste for real food. Food with excessive sugar, fat and flavorings tested to “addict” eaters is known as hyperpalatable. Recognizing that many people are making an effort to eat healthier, food companies are producing products that sound healthy, but really aren’t. And the sad thing about this is that magazines are writing features that are nothing short of advertorials for these convenience foods. It feels to me like they have sold out. One feature I read recently even went as far as to insult a reader who chooses the “sit down bowl of oatmeal” over rushing out the door and eating a bar on the way to an appointment. Wow. I’ll take my bowl of oatmeal any day over bars that have xantham gum and “natural” flavors, which are not really natural at all and can contain a wide range of chemicals. Some of the foods mentioned in articles contain aspartame and sucralose, chemicals that I’ve established give me horrible migraines. How painful is it to get up fifteen minutes early so you can eat your meal at the table instead of in the car (and possibly feel a whole lot better the rest of the day as a result of this choice)? I’ll leave that for you to decide. If grab and go is all that matters to you, then some of the “healthy” items in plastic packages that the fitness magazines boast about might do it for you. I’ll give them this much – they’re better than a greasy burger or a fake shake at a fast food restaurant! But I’m not interested in jumping on this convenience food band wagon that too many fitness magazines are pushing us to jump on. One reason I didn’t renew my subscription to IDEA Fitness Journal is that I was so turned off by the rash of nutrition features lately, which encourage fitness leaders to consume these packed foods, serve them to their families and spread the word about them to their class participants and clients. So many fresh food meals take only minutes to create and taste so delicious! As for me? I’ll continue to encourage everyone within my circle to eat as close to the source so they can reap the feel-and-look-good benefits this choice has to offer. If you have good intentions of exercising every day and most of the time it never happens, you’re not alone. 80 percent of Americans do not meet the recommended activity levels for strength training and aerobic exercise. Sunday night, set up a schedule for the week. For example, my typical week looks like this. In Tucson, I swim an hour on Tuesday, Thursday, and Saturday about 6:30 or 7 AM. On Monday and Wednesday, I teach yoga classes and take a thirty-minute walk. On Friday, I teach a dance-aerobics class. When I spend time at our condo in Mexico, I swim in the ocean for 30-60 minutes every morning upon waking and walk for an hour every evening. When the weather is good, I kayak so I watch the sea and choose a day or two a week to go out for 2-3 hours. I have more time to exercise than most people, but here’s what my IT manager husband’s workout schedule looks like…Monday, Wednesday and Friday – Masters swimming workout 5-6 AM. Tuesday and Thursday 5-5:45 AM run about 3 miles. 3 evenings after work, he goes to the gym to lift weights. Participate in classes offered at your work (my husband sometimes does this once or twice a week). To work in short bouts (aiming to achieve about 30 minutes of total movement during the day), consider these as options… Walk outside or the up and down the halls or stairs at work during part of your lunch hour. Do a short walk before work. Walk or bicycle after you get home from work. Purchase a stationary bicycle or treadmill for home use and USE IT. Listen to your favorite playlists or watch the news or other programs you like on TV to stay motivated. Anytime you can be active while watching TV is better. In general, most Americans spend too much time parked in front of computers and the TV. When my children were infants, I used to do exercise DVDs and also had a bench step so I could do that while I watched TV. Keep in mind that getting the body in motion is the hardest part. Once you get in the habit of moving a lot, it becomes a habit and your body crave the healthy movement that it needs to function optimally. Today, I’m in Mexico, about to face Tropical Storm Lidia. So I stayed inside and did a Vinyasa Yoga practice and plan to do a lot of housework to stay moving today. If you have questions on how to get started or want to share your secrets with others, please feel free to comment. I hope you take steps to care for yourself today!